Another welcome sight from this varied and early flower. 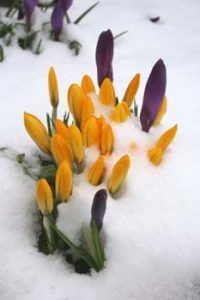 This month I have been lucky enough to speak to several experts about one of Britain’s earliest spring flowers, the crocus. So if crocuses aren’t native to Britain – where do they come from? Depending on the specific species, they can be found growing wild across much of central and southern Europe, North Africa, the Middle East and China. Their glorious colours and tendency to bloom early made them popular with gardeners, and so they were brought over to the UK, where they (luckily) grow without seeming to affect other species. Gradually bulbs have made their way into woodlands to grow wild, perhaps because of gardeners dumping them after producing too many. One of the most common species now found growing wild is the Crocus tommasinianus which has delicate lilac flowers and narrow leaves, and was first recorded in woodlands in 1963. Crocuses are part of the iris family and are perennial, which literally translates as a plant that lives for two or more years. 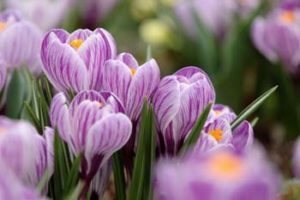 Perennials typically flower during spring, and die back over the winter months, although certain types of crocus are in fact autumn bloomers, one of these being the saffron crocus, Crocus sativus. Saffron crocuses are now entirely cultivated, as around 3,000 years ago humans began selectively breeding plants with longer stigmas. Since then saffron has been used in the treatment of 90 documented illnesses, as well as used as a dye and perfume. Romantic portrayals of saffron have included Cleopatra using it in her baths, and the Greek character Crocus being transformed into a flower. Ok, so it’s not native, but a large percentage of the British landscape isn’t. Just think of grey squirrels, fallow deer and buddleia. I think with such a rich history, we can accept the crocus as a staple of the British woodland, and delight in its delicate flowers this spring.